Sister Mary Rosina Burns, I.H.M. 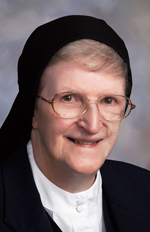 Sister Mary Rosina Burns, I.H.M., died Nov. 16 in Camilla Hall, Immaculata, in the 60th year of her religious life. She was 78. She entered the Congregation of the Sisters, Servants of the Immaculate Heart of Mary on July 16, 1958 from St. Clement Parish in Philadelphia. She professed her vows on Jan. 17, 1961. Sister Mary Rosina taught briefly in the elementary schools in the Archdiocese of Philadelphia after professing her vows. While earning her RN degree, she served her congregation’s elderly and infirmed sisters at her beloved Camilla Hall beginning in August 1968 until her death in November 2018. Sister Rosina modeled professionalism, dedication and compassion throughout her life of service. Sister Rosina is survived by her local community at Camilla Hall; her brothers John (Rose) and James (Sonja), and her sister Elizabeth Anne Bradley (George); and many loving nieces and nephews, grandnieces and grandnephews. The funeral Mass was celebrated Nov. 18 at Camilla Hall. Father William E. Dean was the celebrant and homilist, and Norbertine Fathers Joseph McLaughlin and William Trader concelebrated. Deacon Kenneth Cavara assisted. Countless associates, friends and IHM Sisters were present for this celebration of Sister Mary Rosina.